The tragedies of September 11th will never be forgotten. It was a time of tragedy that made us grieve immensely for those who lost loved ones and defend our country like never before. 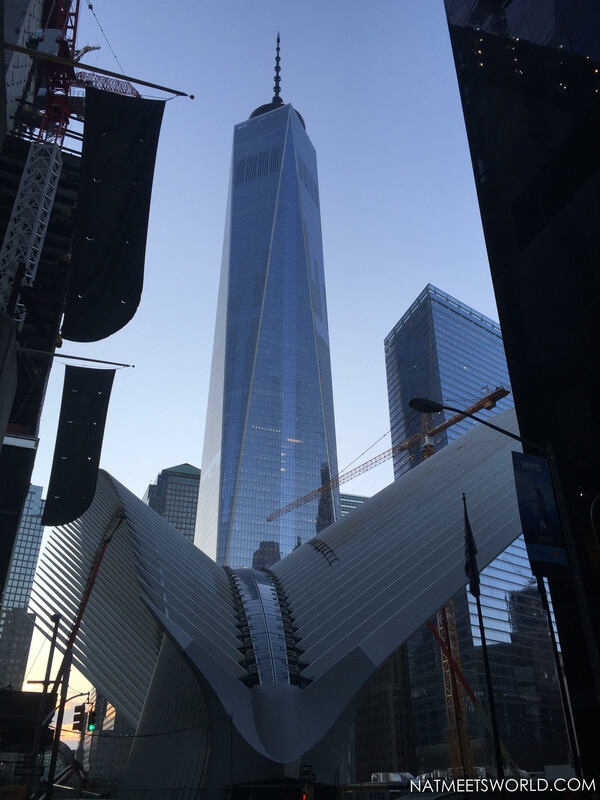 While the devastation of losing the twin towers was absolutely terrible, the introduction of the One World Trade Center has to be one of the greatest ways to rebuild what was lost. Luckily, I had the opportunity to check it out just after a month of its inaugural opening. Upon arriving, I could not stop staring at this massive beauty. 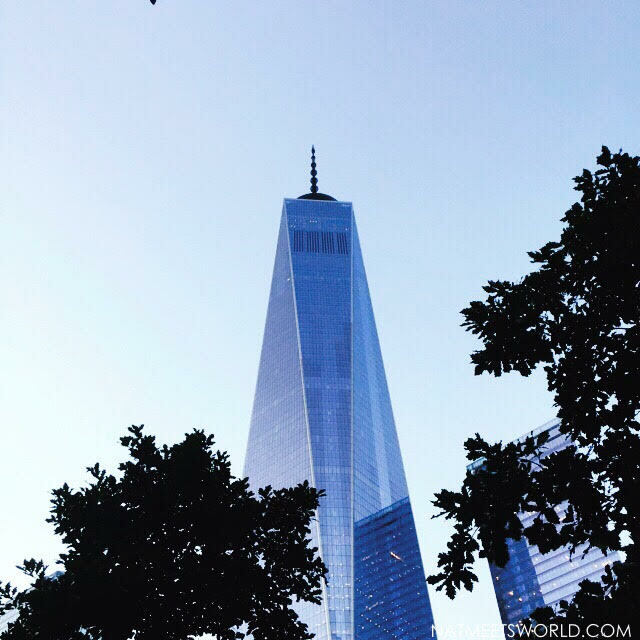 It’s modern yet sleek structure rises soooooooo high above the city, with a whopping 104 floors, making it the tallest structure in the western hemisphere (and the 4th tallest building in the world). I knew I was going to walk into an incredible experience just by its exterior beauty. Upon entering, we were able to see a large video board with a map that showcased the hometown of all of the visitors. This was in the Global Welcome Center. It was really cool to see how many different people visit from all over the world. After this, we walked into the voices and foundations section, which allowed us to hear the personal stories of the construction workers on there experience in building this beauty. We were also able to see the bedrock on which the foundation stands on. 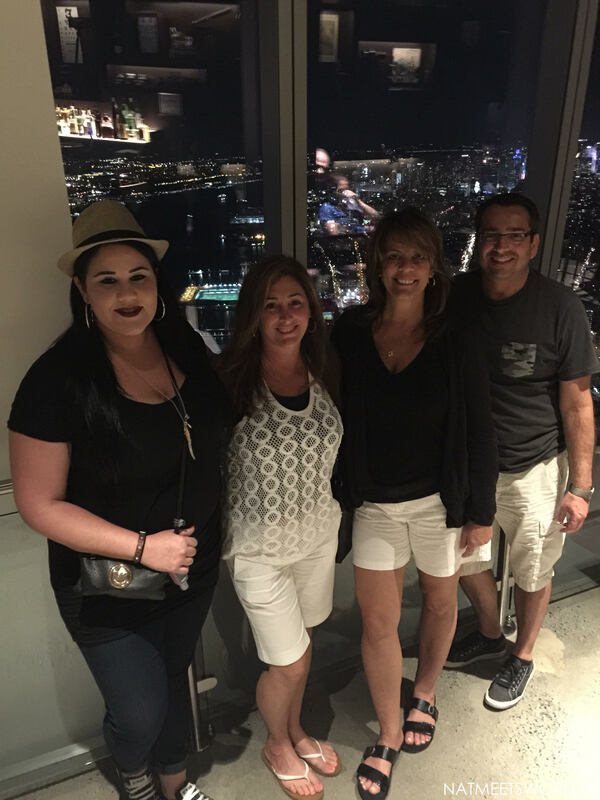 After all of that good stuff, my friends and I were escorted to the beautiful Sky Pod elevators which took us from the first floor all the way to the 102nd floor in less than 60 seconds (yes, you read that correctly, less than 60 seconds). 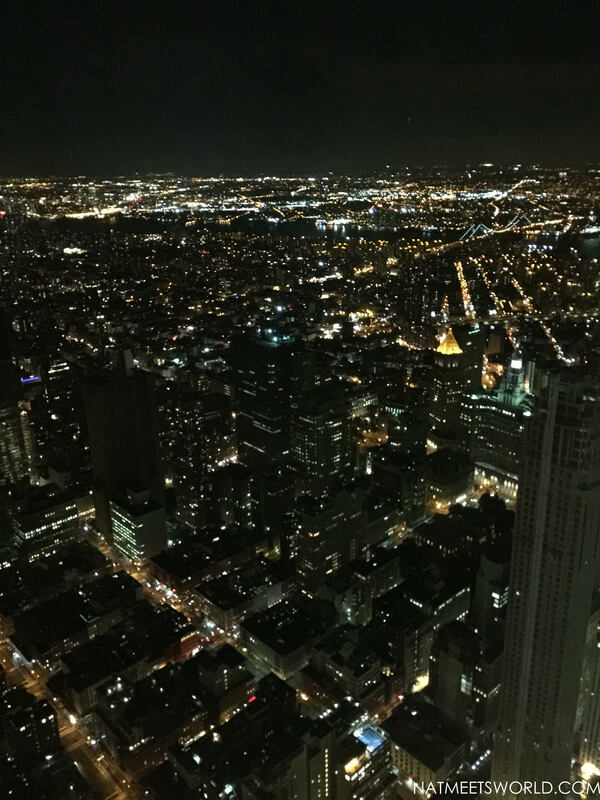 While riding up to the top, we were shown a virtual time-lapse which showed the evolvement of the New York City Skyline starting with the 1500s and working its way up to the present year. It was so fascinating that so much has changed throughout these hundreds of years to create this concrete jungle that everyone loves so much. I could not believe that the entire elevator is covered with screens to make this video completely immersive. The elevator ride was enough to make my jaw drop! 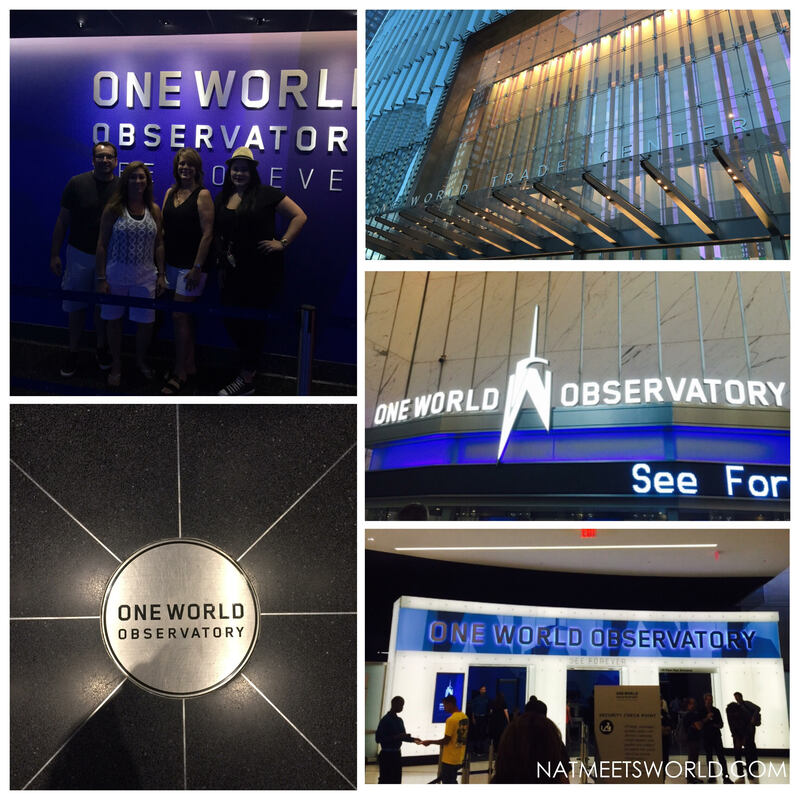 Once we arrived to the 102nd floor, there were many things for us to indulge in. We started with the See Forever Theater which shows a two minute video with various time lapse shots to show an abstract pattern of the rhythmic New York lifestyle in 3-D. This presentation was truly amazing. 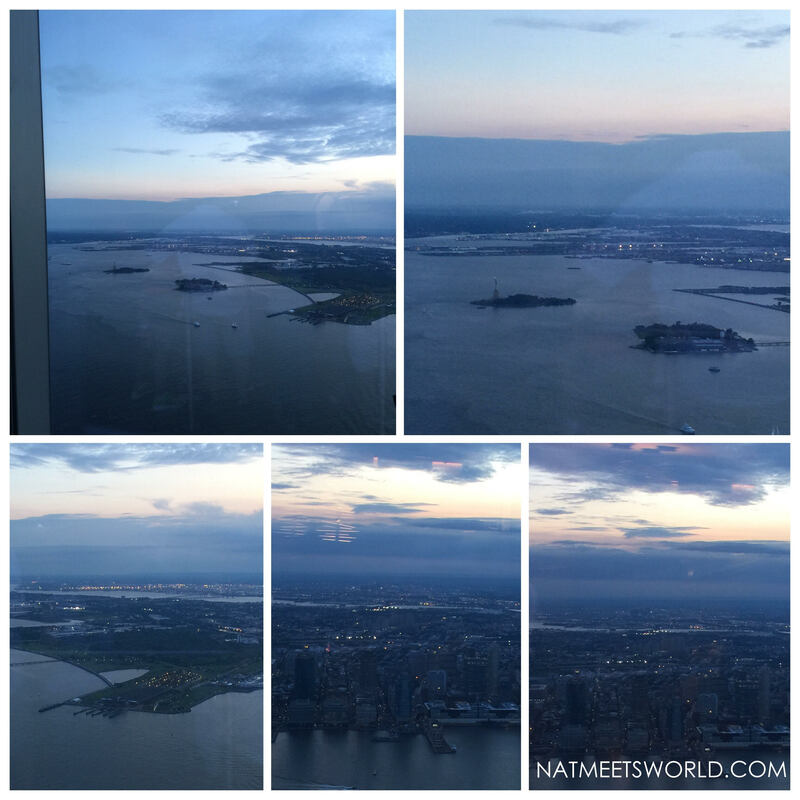 Once we reached the 102nd floor, we were introduced to breathtaking 360 degree views of New York City. My pictures won’t do it justice because it is truly an awe. I loved that we went in the evening because the city was completely lit up and shining bright. There are also several cool things to do on this floor besides looking over the entire city. The sky portal offers footage of the ground below in real time. It makes for great pictures because it looks as if you are standing on top of the actual area. There is also an interactive skyline concierge that allows guests to delve into the New York landmarks. Here I am on top of the Sky Portal! The LED technology throughout the entire building is quite fascinating, but their food was no exception. 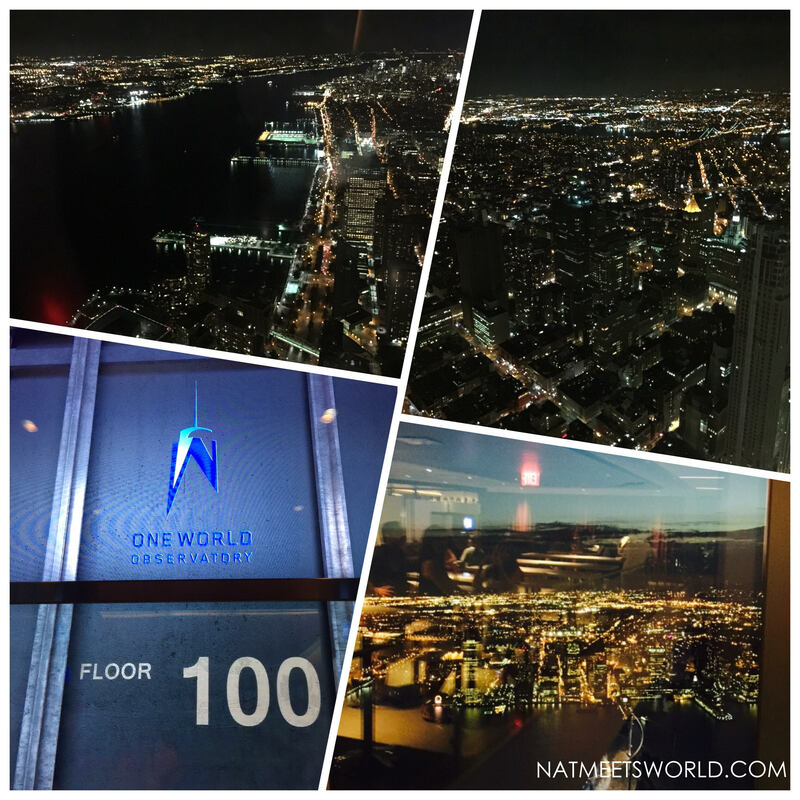 There are a couple of options for dining on the top floor of the One World Observatory. The One Cafe offers spirits and small plates including sandwiches of all kinds and pizza. My margarita pizza was amazing! The chef made it right in front of me with the freshest ingredients. There is a standing area for guests who dine here. 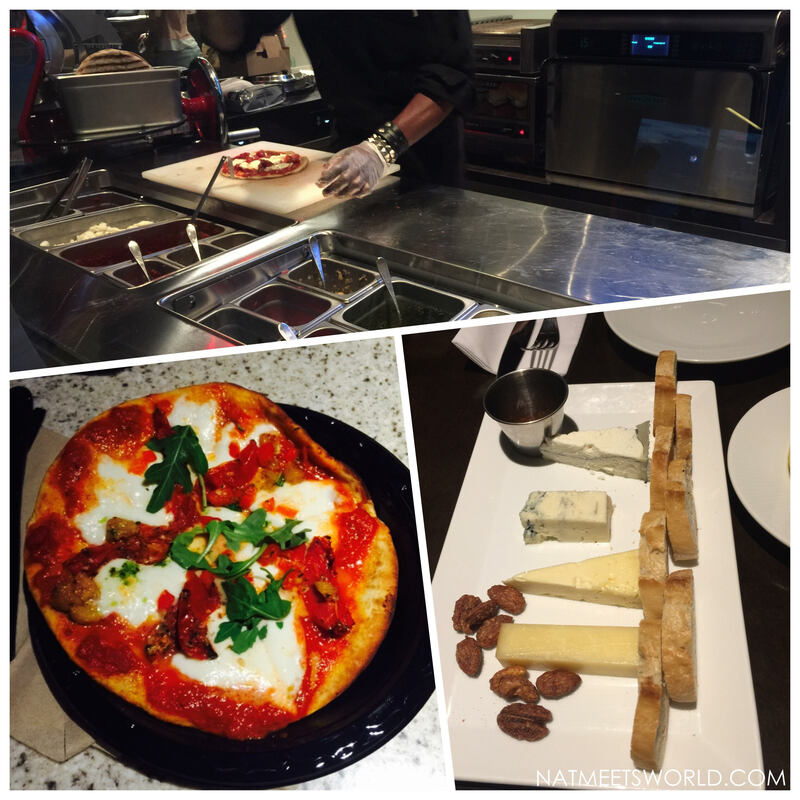 After enjoying my pizza, we decided to get some drinks and more small plates at One Mix, which also offers small plates and drinks with a little more class. Here you can sit and enjoy views of the city. If you are looking for a great dining experience, you can check out One Dine which offers extraordinary food with a seasonal four course menu. Advanced reservations are required for this restaurant. 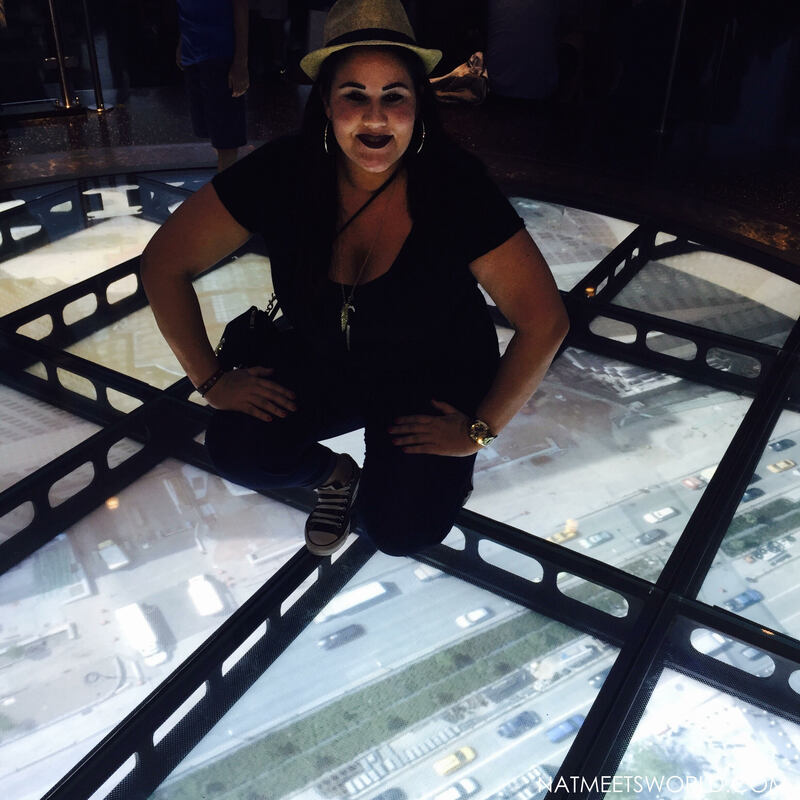 I really enjoyed the One World Observatory and I can’t wait to see it again and again for years to come.Have you visited yet? What did you think? Comment below! « Aladdin on Broadway at New Amsterdam Theater!